Sometimes I think the lapsed vegetarian in me is also the lazy vegetarian. Apart from the easiest dinner—which is cheese, crackers, and wine—I’m frequently more than happy to just eat a big plate of veggies for my meal and call it a night. That’s not to say, sadly, that I tend to get too creative with my choices. Spinach over grains. A baked potato covered in salsa and sour cream. Green beans or snap peas with peanut noodles. The occasional kitchen-sink (er, crisper drawer) pasta primavera. I get it. It’s easy to fall back on your tried-and-true, pull-together menu options. It’s even more daunting when you have to feed people other than yourself. Author Tara Mataraza Desmond knows this too, which is why she’s gone ahead and given us 130 (!) different ways to get out of our recipe rut with the cookbook Choosing Sides: From Holidays to Every Day, 130 Delicious Recipes to Make the Meal . Choosing Sides definitively answers the age-old question, “OK, what else am I gonna make?” With chapters smartly divided into themes like “weeknight dinners” or “potlucks and parties,” the book pre-empts the issue of what to bring to the next group get-together, what to serve when asked to contribute a dish to the family reunion, or what you do to mix up your menu for tomorrow night’s dinner. Though they may have been conceived as sides, many of these accompaniments can more than stand on their own as the centerpiece to a meal. 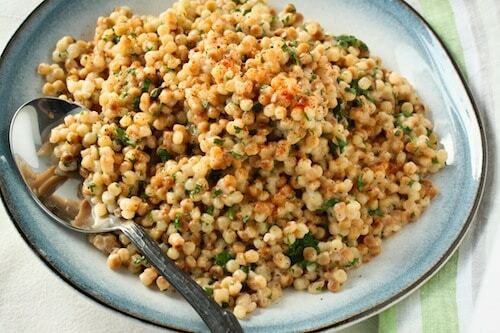 Hearty grains like bulgur with apricots, golden raisins, and pistachios or one-pot dishes like coconut cilantro toasted Israeli couscous (recipe below) don’t even need a meat pairing; they’d do well with any of Desmond’s suggestions for green salads and slaws. And a side of her Northern Girl herbed biscuits: as a Northerner myself, I’m sold on her tuck-and-fold method as a shortcut to an impressively flaky rise. And for those of us who like to mull over the Thanksgiving menu for months in advance (I did an informal Facebook poll, I know you’re out there, my fellow planning freaks), this cookbook will send your creative juices into overdrive. I mean, what is Thanksgiving but an opportunity to eat sides all day long? 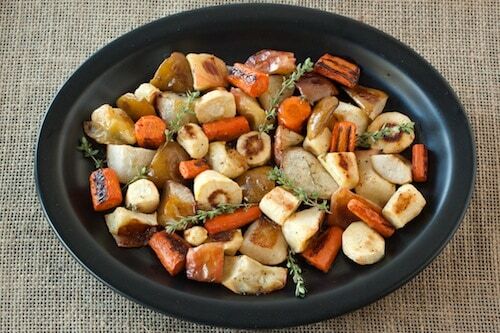 This year, my buffet will feature a platter mounded high with Choosing Sides’ roasted roots and fruits with cider butter: a gorgeous mix of parsnips, carrots, apples, and pears tossed with a sweet and tangy butter glaze. 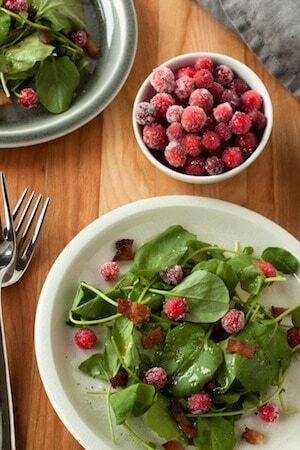 On the side, because I always need a little crunch to offset my spread of mashed potatoes and stuffing, will be a simple bowl of arugula with sugar cranberries and pancetta. Truth: the sugar cranberries alone are a snack in themselves. Make a double batch and sneak them while you’re setting the table. 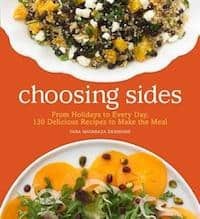 Because I want to make your Thanksgiving that much better this year (and bring more fun to your potluck dinners, and your summer cookouts, and just your regular Wednesday nights), I’m giving away a copy of Choosing Sides. Enter now and you’ll have it in time to choose a new favorite for the big day. Heat a 2- to 3-quart deep sauté pan over medium-high heat for 1-2 minutes, until you can feel heat rising from the bottom of the pan when you place your hand over it. Add the couscous to the dry pan and cook, stirring occasionally, for 3-4 minutes to toast the couscous until golden brown. As Tara notes in the book, it will give the most heavenly “baking bread” aroma as it toasts. Stir in the coconut milk, water, salt, pepper, and cayenne or paprika. Bring to a boil, then cover and reduce the heat to low. Simmer the couscous for about 15 minutes, until it is tender and has absorbed most but not all of the coconut milk. You still want a creamy sauce binding the couscous.